Lavender, Lavandula angustifolia, has always been one of my favorite scents. It's so soothing and calm, and isn't overtly bright and cheerful (which is good, but living in the Sunshine State means that I'm inundated with bright and cheerful year round). I've been blending my own essential oils to make perfume, beauty products, and air fresheners for some time now. Lately my favorite combination has been Frankincense, Lavender, and Vetiver. It just smells so mysterious. But aside from it's use in aromatherapy and as a pretty scent, Lavender is a necessary ingredient in certain cooking herb blends, such as Herbs de Province (a classic French culinary blend). It has so many uses, and is a great plant to have around the house as well. It truly is one of my favorite herbal allies. Parts Used- All aerial parts while the plant is in flower, or just the flower. Traditional Chinese Medicine- Known as Xun Yi Cao, Lavender is used in Traditional Chinese Medicine (TCM) to clear heat, remove toxicity, expel wind, and relieve itching. It's pungent and cool and primarily used for sore throat, burns, rubella, tongue boil, headache, scabies, dizziness, and aphtha (inflammation of the mucosa of the mouth). Ayurvedic- In Ayurveda, Lavender is known as a Medhya herb (improves cognitive function) for it's ability to energize and empower the mind and stimulate brain function. Lavender actually effects each of the 3 doshas. It pacifies both kapha and pitta while aggravating vata. It is known to enhance prana, strengthening the immune system. Essential Oil and Aromatherapy- This is the main way I use Lavender. The essential oil is absolutely wonderful at reducing stress and anxiety, improving sleep, and soothing the mind while stimulating it as well. 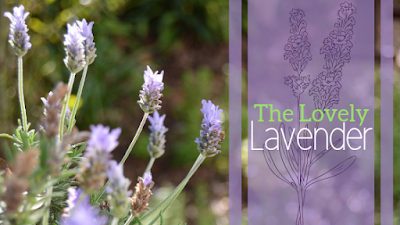 Pain Relief- Lavender is great for topical pain relief. It takes the “burn” right out of minor burns, helps reduce the “sting” from bug bites and minor cuts, and even helps reduce headaches when massaged into the temples. I even had a friend one time who had a headache for several days, nothing worked for it. I happened to have some diluted lavender essential oil on me. When she smelled it, her headache stopped throbbing, but was still there. Then I had her massage it onto her temples, her headache disappeared in just a few minutes. It's good stuff. Wound and Burn Care- Lavender essential oil is one of to essential oils I always stock in my first aid kit (the other is oregano). I also keep dried lavender flowers, just in case. The reason I love lavender in my first aid kit is because it's so good for minor wounds and burns. There have even been studies done about the effect of lavender on wounds from major surgeries. Not only does it help improve the healing of the skin, it also acts to reduce pain and itchiness. I literally use it on just about everything from bug stings/bites, to minor burns, to cuts and scrapes, even to eczema and psoriasis. Soothing Nerves and Improving Sleep- The scent of lavender is usually enough to relax most people. Helping reduce anxiety, relieve depression, and improve sleep. It seems to be especially helpful to mothers during the postpartum time, college students, and people with special needs (helping to reduce the frequency of self harming behaviors). Research has even found that exposure to lavender before a stressful situation not only reduces the amount of stress one feels during the situation, but also helps recover from that stress much faster. One of my favorite applications for lavender is in a sleep pillow to help improve the quality of sleep. Insect Repellent- This is one of the few things that actually work to repel the Noseeums that can be found in Florida. But lavender also works to repel mosquitoes, fleas, and ticks. Skin Care and Hair Growth- Lavender's anti-inflammatory effects help to improve the health of skin and hair. There are some people who have noted some irritating effects from the lavender, but most of those can be attributed to using undiluted lavender essential oil. When the tea is used as a wash, or when a properly diluted essential oil is applied, it cleanses the skin and hair, as well as improves hair growth and helps make the hair shiny and full. A strong tea also helps get rid of dandruff and can be used to help remove makeup (I usually mix it with some coconut oil for this). Other Historical Uses- In the Medieval period in Europe, most of the floors in common homes were dirt. Most people covered the dirt with a combination of dried rushes/grasses and lavender flowers. Not only did this smell wonderful, it also kept bugs out of their houses, thus reducing the spread of diseases such as the plague. Lavender was also used during the plague to keep the smell out of the noses of the physicians and others attending to the sick. While they might have been using it to make the stench more palatable, it also helped keep them from falling ill.
Contraindications and Warnings- Generally speaking, there are none. However, those of you that are allergic to mints may have a reaction with lavender. You can also have a reaction to the pure essential oil if you do not dilute it in a carrier oil. I only included a basic introduction to this amazing herb. I hope you have learned a new appreciation for one of my favorite allies, Lavender. If you have any questions or comments, please leave them below.